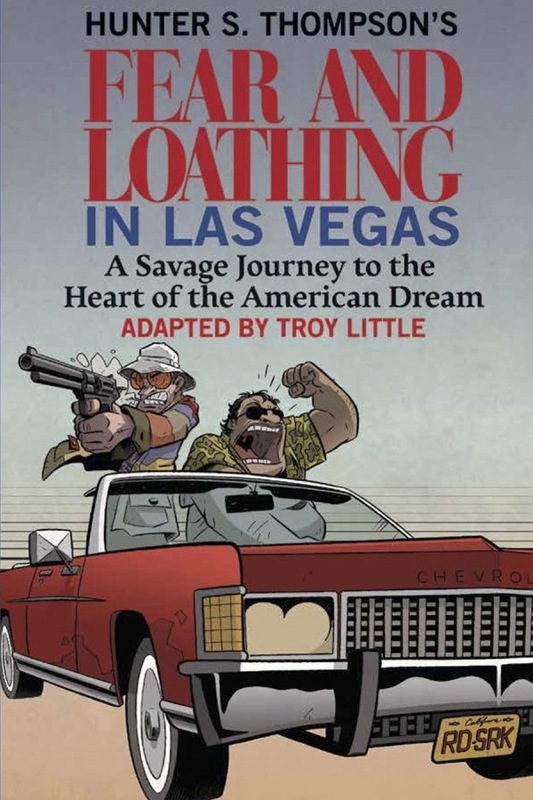 It’s easy to imagine that Hunter S. Thompson would have loved this latest adaptation of Fear and Loathing in Las Vegas – a pair of Rolling Stone magazine articles that became a novel, a feature film, and at one point, a stage production before its latest stop as a graphic novel. Not bad for a pair of drug binges in a desert gambling mecca. Thompson’s search for the soul of America in the wake of the cultural and political shifts of the 1960s has clearly resonated for generations well beyond the Baby Boomers. Whether or not Thompson actually captured the essence of the American Dream through the haze of mind-altering chemicals, the journey to getting there is flat out hilarious. Taking large swathes of narration from the original, Troy Little handles the full adaptation duties without an additional writer. Little’s highest profile work to date has been as writer/artist on a Powerpuff Girls series (a natural fit given his day job as a professional animator), but his individual style has developed more organically in the Xeric Grant-winning Chiaroscuro and graphic novel Angora Napkin. 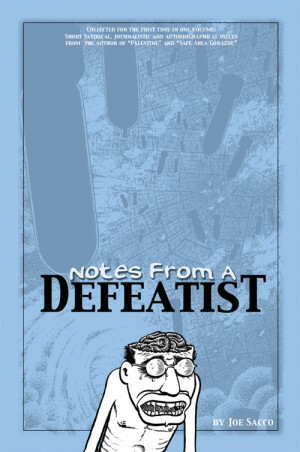 His independent work is lively, sharp and appealing, but more grounded than you’d expect from such a cartoony approach. Whether it’s the influence of Thompson or the Powerpuff Girls, what Little does with Fear and Loathing seems to defy physics as reality warps around their LSD and ether use and reaction shots approach Tex Avery proportions. His energetic panels employ some Roger Langridge, some Marc Hempel and just a dash of Peter Bagge. Little’s consistency and ongoing cleverness is a tour de force performance. The story is familiar by this point. 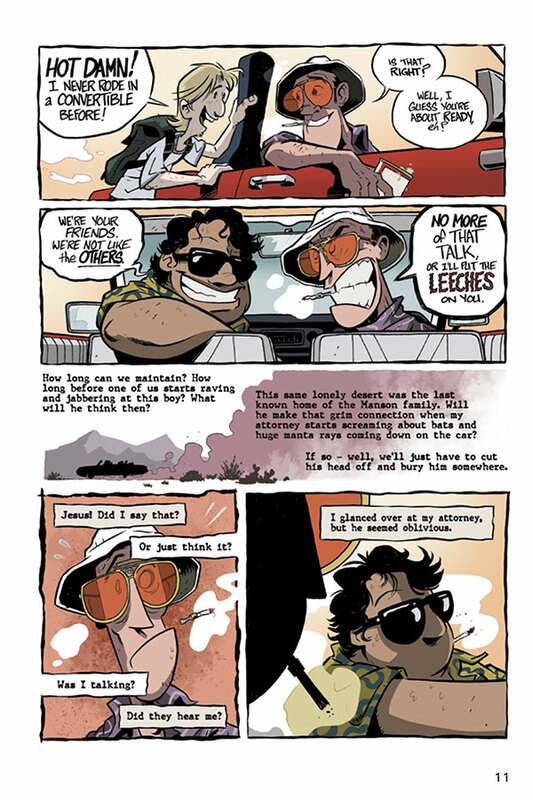 Hunter Thompson receives a journalism assignment to cover a Vegas motorcycle race and lights out from LA with his lawyer, known to him as Dr. Gonzo and possibly Samoan, a rented bright-red convertible and a trunk full of medicinal brain blasters. They witness almost none of the race, but manage to create chaos wherever they go. 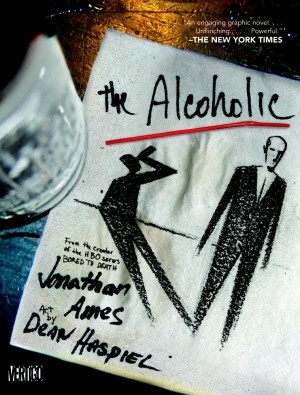 Sinking into delusion and paranoia, Thompson tries to flee the city, only to be drawn back by a second gig to document a convention of drug law enforcement officers who offer the most distorted middle-America-frightening perspective on drug use since Reefer Madness. Thompson is left with nothing at the end besides a destroyed hotel suite and a notebook scrawled with observations on the passage of sixties idealism. Most of the fun is derived from watching two drug-addled lunatics get into trouble, tell wild tales to confused service people, elude the cops, and generally mess with peoples’ heads. They pick up several unsuspecting bystanders – a hitchhiker who practically leaps out of the car once he realizes they’re insane, and a young woman whose pastime is painting images of Barbara Streisand and who soon gets her first LSD experience. Both are innocents who have never been to Vegas and represent aspects of the shallow “American Dream”. 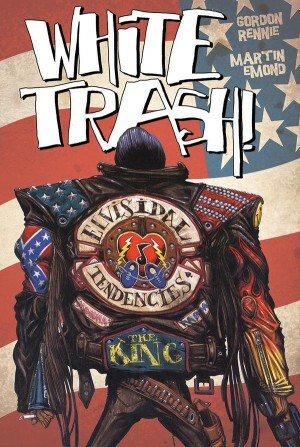 Both get more of the crazy side of America than they bargained for. Little will be challenged to find another story that suits his abilities better than this one. What’s lost from Terry Gilliam’s film in terms of Johnny Depp’s performance and the numerous star cameos is more than replaced with the artwork’s bright, colorful, goofy caricatures and spectacular scene setting. He’s very much kept the spirit of the book as a living, evolving tome, and the different versions of this story all seem to complement one another, Hitchhiker’s-Guide-like, right to the hazy morning hangover.